At the request of DB I made some simple, homemade comfort food. We rarely eat at home on Monday night's as we opt to get out of the house and have a few drinks instead but this week was an exception. Monday nights do seem to be a good night to partake in some soul-warming food though. I decided on making Stuffed Meatloaf, Whipped Potatoes and Corn. I had been craving this meatloaf for a good while now and luckily I remember how I did it before. (I've only made it once before). One of the main reasons I wanted to start a blog was so that I would HAVE to write down my recipes. I never write them down, hardly ever follow one and refuse to share them - till now. I love looking at recipes for inspiration but its a very rare instance that I would follow one to a T when it comes to cooking. I also don't measure, so most everything is a "guesstimate" as to the proportions but close enough. Inspiration: This recipe is actually derived from one Rachael Ray does. I caught a 30 Minute Meal and this was the main dish. This was well over two years ago so I have no clue what her recipe is. 1. Mince garlic and shallot. 2. In a large mixing bowl, crack and whisk the egg. 3. Add meat, garlic, shallot, oregano, parsley, basil, bread crumbs, Parmesan cheese, worcestershire and S&P (salt and pepper). Mix well with hands until well incorporated but don't over mix it. 4. Take two cookie sheets and two pieces of parchment paper. Spray cookie sheet with cooking spray. Lay one piece of parchment over the cookie sheet. ****I forgot I was out of parchment so I just sprayed the pan but parchment makes this A LOT easier. 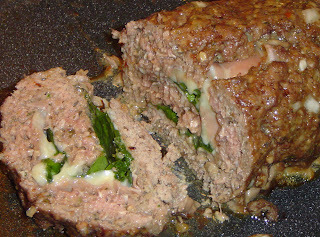 **** Place meat mixture in the form of a ball in the center. Then take 2nd sheet of parchment and lay over it. Take the second cookie sheet and press down until the meat is about 1/3 - 1/2 of an inch thick. 5. Remove top cookie sheet and parchment paper. Layer the three slices of prosciutto, then the provolone cheese and finally the spinach straight down the middle. 6. Start at one side of the meat and slowly roll the meat to the other side. Remove parchment and flip the meat so that the seam side is down. Mold and pinch the ends to create a seal to keep the cheese inside. 7. Preheat the oven to 350 degrees and bake for 25 - 30 minutes. ** I prefer to take mine out when its still just a little bit pink. 8. Let stand for about 5-10 minutes and then cut into 1" thick slices to serve. My thoughts on this dish: Its super simple and a nice twist on a pretty standard comfort food. I was very happy with the flavor of the meat. All the flavors blended really well and it was super moist. I was a little concerned that I put too much garlic (which is very rare for me because I love it) but BD said he couldn't even taste it. If you aren't a garlic fan you might to use a little less just to be on the safe side.